The crotch-grab that launched a career. Last week, attention returned to Mark Wahlberg‘s 1988 attempted murder and contempt of court charges relating to a series of hate-related attacks targeting Vietnamese American and Black victims after the actor submitted a request to have his criminal record expunged. Yesterday, the Daily Mail published an interview with one of Wahlberg’s two 1988 assault victims, wherein the middle-aged Vietnamese American husband and father forgives the actor for his wayward youth, and supports the pardon request. Yesterday, I expressed that I appreciated and respected Trinh’s forgiveness, but wondered whether there was more room for Wahlberg to be — as he says — a leader, and not a follower on community service. I suggested that perhaps Wahlberg could pay restitution to Trinh and his other victims — who are named in the criminal complaint — as compensation for the physical and emotional damage he inflicted upon them in relation to his bias-related assaults. I suggested also that he could donate some of his Hollywood salary to the Committee Against Anti-Asian Violence (CAAAV) and to the Gay & Lesbian Advocates & Defenders (GLAD), the two advocacy groups that solicited his original 1993 apology for the assaults. CAAAV, in particular, could use the funds: the group is focused on (among other campaigns) organizing vulnerable multi-racial and multi-ethnic communities of recent immigrants living in low-income housing in New York City, and are doing so on an annual operating budget of roughly $300,000/year. That’s less than 2% of the money Wahlberg earned for starring in Transformers. Or, here’s another great idea: Mark Wahlberg should finally — after 21 years — agree to make that anti-racist public service announcement commercial he promised he would make in 1993. In the years after Wahlberg served his 45 days for his 1988 crimes, he cleaned up his act and went on to start his career in entertainment. By 1993, Wahlberg was tapped by Calvin Klein to be their underwear model. An image of Wahlberg clad in some white CK boxer-briefs was soon found plastered all over New York City in subway trains and on payphones, and was even installed as a billboard over Times Square. Frustrated that the newest face of men’s underwear was a person who had been convicted of a racialized violent crime targeting minorities, CAAAV decided to join forces with GLAD in 1993 to launch a campaign to raise awareness about hate crimes and bias-motivated violence, centered around demanding that Calvin Klein remove Mark Wahlberg as their spokesperson. Because this campaign occurred before the widespread popularity of the internet, few records of it are easily accessible by digital sources. So, earlier this week, I spoke with sources from CAAAV this week, and they recounted the details of the campaign to me (and, it sounds just plain epic): CAAAV and GLAD printed out more than 1500 bright orange bumper stickers with the words “Marky Mark – Convicted Racist” on them. 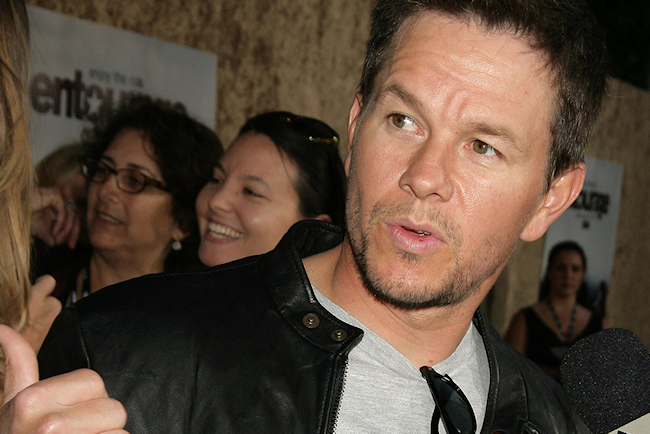 Hundreds of volunteers scoured the streets of New York City and stuck the bumper stickers onto any of the ads they could find, exactly over Wahlberg’s strategically situated right hand. CAAAV and GLAD also organized a press conference held in Times Square. They got a life-sized cardboard replica of Wahlberg’s poster with his boxer briefs and his hand over his crotch. They put a real pair of cotton briefs on him, and stood him next to replica tombstones bearing the names of the victims of anti-Asian hate crimes. And, in front of an assemblage of journalists and photographers, they pulled Marky Mark’s briefs down, to reveal the orange bumper sticker over his crotch. Wahlberg’s publicist also agreed to have Mark Wahlberg star in an anti-racism or anti-bias public service announcement. I learned this week that this negotiated PSA never happened. That decision [to cancel the PSA talks] was made after the underwear poster boy assaulted a record company executive in Los Angeles. The police report filed by the bashing victim in Los Angeles stated that the altercation began when Mark “started making disparaging remarks about homosexuals.” Warner Bros. has confirmed that Mark was in a violent altercation with Maverick Records executive Guy Oseary at a party on July 31. But my sources at CAAAV could neither confirm nor deny this particular account. Instead, they said that at least part of the reason the commercial was never made was because neither CAAAV nor GLAD had the resources to make it. At the time, neither CAAAV nor GLAD had the resources to hire the writer or production crew, or to otherwise fund the making of this public service announcement. They had a (perhaps reluctant) star, but no ability to actually make a commercial. I further learned that while Wahlberg’s publicist had committed Marky Mark to appearing in the commercial, there was zero interest in helping in any other way to help the project get realized. So here’s a radical idea. Mark Wahlberg, I really want to believe you when you say you are a changed man. I believe that convicted criminals can change. You said this week that you wanted to be a leader, and not just a follower. So, prove it. Prove not only that you have changed, but that you have changed into a person who will be a leader in the fight to end racism and racial violence. I understand that in 1993, you were just a shirtless underwear model with limited resources. But now, 23 years later — I challenge you, Mr. Wahlberg. I challenge you to take the millions of dollars you have earned; to tap the Hollywood connections you have made; to apply the acting talent and the movie-making skills; and to prove not only that you are a changed man, but a mature man who holds himself to the promises he made when he was in his twenties. I challenge you, Mr. Wahlberg to not just make that anti-racism PSA you promised us you would make, but to take the lead in every aspect of its production. I challenge you to return to the negotiation table with CAAAV and GLAD, but this time having brought with you the best writers and directors, the best lighting and sound folks, and the best special effects gurus that Hollywood has to offer. I challenge you to use that star power to solicit the widest reach that television and movie-making executives can possibly muster. Today, 18MillionRising offered Mark Wahlberg 8 things he can do to atone for his crime. Here’s a ninth: Mr. Wahlberg, make the most amazing jaw-dropping anti-racism public service announcement the world has ever seen. Previous Previous post: Mark Wahlberg’s victim clarifies the record & forgives actor – but is it enough? Next Next post: Why I’m refusing to consume the news from the #Sonyhack — and you should, too.